Euxoa auripennis is a small to medium-size Euxoa (FW length 13–16 mm) with brown-gray median area, black cell, light blue-gray base, subterminal area, and filling of the spots, and a red-brown thorax that flies in forests east of the Coast and Cascade Range summits during the summer. The forewing is relatively short and broad. The ground color is light blue-gray, palest at the base of the costa. The cell is black. The median area near the cell and mid-base are suffused with dark gray brown, sparing the posterior margin and the fold near the tip of the claviform spot. A rusty flush is often present in the median area and anterior subterminal area. The terminal area except the apex is dark gray. A thick black basal dash is present. The cubital vein is light gray, and the veins in the subterminal area area dark gray. The basal line is two dark spots on the costa. The antemedial is similar on the costa, is interrupted by the light gray costa and black cell, continuing below the cubital vein as an undulating black line that is angled toward the outer margin. The median line is a faint gray shade below the reniform spot in some specimens. The postmedial line is dark gray, lightly scalloped, double with strong inner and faint outer components, filled with the ground color although the reddish flush extends through the anterior portion of the line if present, usually less distinct near the cell than below it, drawn toward the base on the costa, square lateral to the reniform spot, and angled 45° toward the base below the level of the cell. The subterminal line is only evident as the transition between the blue-gray subterminal and darker terminal areas, smoothly undulating and drawn toward the base across from the cell and in the fold as two bulges of its inner margin. It is preceded by a dark spot on the costa. The terminal line is dark, a thin line or series of spots. The fringe is gray. The orbicular and reniform spots are moderately large, outlined in black and filled with the light gray ground color, with faintly darker centers in dark specimens and a reddish flush in heavily tinted individuals. The orbicular spot is round or ovoid, often open toward the costa. The reniform spot is kidney-shaped or weakly figure-eight-shaped. The claviform spot is gray to solid black, small to moderate-sized. The hindwing is light gray, darker gray toward the margin, with barely darker discal spot, veins, and terminal line. The hindwing fringe is white with a patchy gray base. The head and base of the collar are pale blue-gray, with a thick black transverse line at the base of the red-brown edge. The thorax is red-brown with a pale gray median stripe. A frontal tubercle is present. The male antenna is biserrate. Euxoa auripennis is a member of the large subgenus Euxoa. This species and Euxoa servitus are distinguished from other Euxoa species in our area by the pale blue-gray ground color that is present on the costa and fills the forewing spots. Euxoa auripennis can be distinguished from Euxoa servitus, which has a more northerly and eastern distribution but overlaps the range of E. auripennis in a large portion of the Northwest, by its color and the shapes of the subterminal and postmedial lines. Euxoa servitus lacks a red flush on the forewing and has tan rather than red-brown on the collar and posterior thorax. Its subterminal line is irregular opposite the cell, usually with several black streaks, and often touches the postmedial line, while that of E. auripennis is much smoother, lacks black streaks, and does not approach the postmedial line. The postmedial line of E. servitus is smoother than that of E. auripennis and is more distinct on the anterior wing. 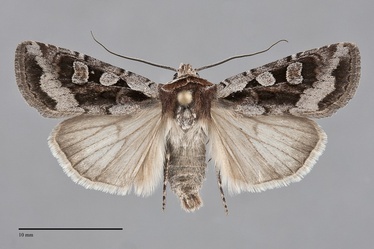 The hindwing of E. auripennis is lighter gray than that of E. servitus which has a brassy sheen. 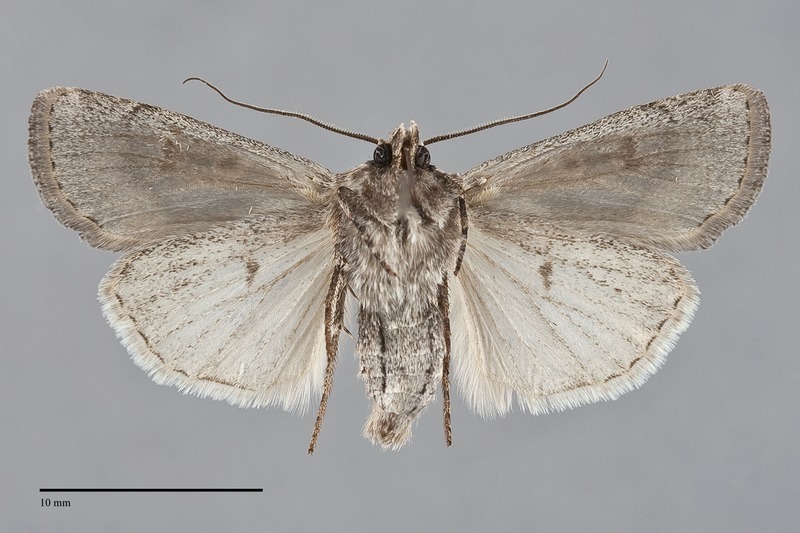 The type locality of Euxoa auripennis Lafontaine is Cranbrook, British Columbia. This species is widely distributed in dry forest and grassland habitats throughout much of western North America. In the Pacific Northwest, it is relatively uncommon in open ponderosa and lodgepole pine forests, and in juniper woodlands at middle elevations east of the Cascades. It is rare in spruce-fir forests along the summit of the Cascades. Euxoa auripennis is also found in dry sagebrush steppe, especially near the forest-steppe transition, but is less common in this habitat. This species is considered to be management sensitive, and benefits from thinning and burning that maintains an open pine forest community. Euxoa auripennis is found in dry forests throughout our region east of the Cascade and Coast Ranges as far north as south-central and southeastern British Columbia. It is absent from the driest portion of our interior basins. The range of this species extends east to Manitoba in southern Canada and to the western Great Plains near the Rocky Mountains in the United States. The southern limits are North Dakota in the northern Great Plains, the central portions of New Mexico and Arizona in the Rocky Mountains, and southern California near the Pacific Coast. Adults are single brooded and fly during the late summer and early fall. They have been collected from mid-July to mid-September in our region. It is a nocturnal species and comes to lights.